Patient was a woman in her late thirties C5 complete quadriplegic, 20 years paralysed. The pressure ulcer was a category 2 of 1.5cm x 1.4cm below the sacral area and had been persistent for 2 years. It had no tunnelling and undermining. It had once closed, however only to reopen. The patient had been on bed-rest for the 6 weeks period prior to Acapsil. Judging only from what was apparent to the naked eye, the ulcer seemed covered with a layer of tenacious biofilm. Acapsil was applied once daily for three days (Day 0, 1 and 2). For the entire period until full closure, the wound was cleaned thoroughly daily with plenty of clean water (shower) and dabbed dry very gently. The wound was either left uncovered or covered with a plain gauze or an N-A (dry, permeable contact layer dressing) of the patient’s choice depending on the immediate activity that was to be undertaken. The patient was encouraged to leave the ulcer to the air as much as possible. She was also encouraged not to sit or lie on the wound but still to get out of bed for moderate amounts of time – with good use of cushions etc. Acapsil was applied once more later in the healing process, due to unforeseen circumstances. It immediately restarted healing. Pressure ulcer on Day 5. Pressure ulcer Day 17 - closed. It was evident that the biofilm disappeared within the first 2 days together with a small amount of non-viable tissue - this tidying process necessarily leaving the wound opening a tiny bit wider and deeper than before first application. The biofilm is a sign of the microbes having gained a strong foothold with infiltration of the deeper and surrounding areas by a variety of infecting agents. The tissue infiltration was gradually cleared over the following days. It was recognizable by the stretching and pulling of the surrounding skin as well as the flakes and scales appearing on the surrounding skin. The flakes and scales are a sign that the skin and the underlying tissue is regenerating and being substituted for healthier skin appearing rapidly underneath. The flakes and scales should be left in peace to fall off in their own time, which will be when the new skin underneath is sufficiently mature. 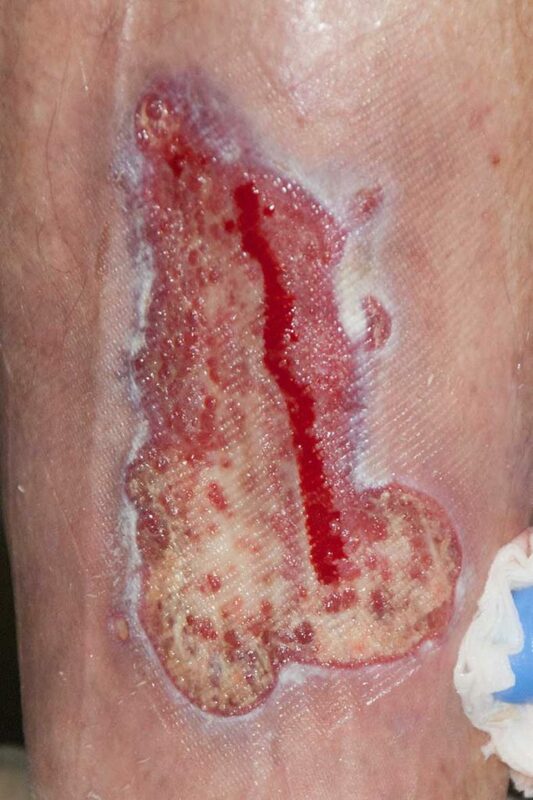 After full closure of the actual skin opening, the wound, the skin continues to mature for approximately 6 weeks. It was also evident how the regeneration of soft tissue would also continue to progress underneath the new skin. This process is likely to take a similar amount of time. The ulcer was fully closed (epithelialised) on Day 17. As a consequence of hospitalisation, ICU, in connection with initial spinal injury, an approximately 60-year-old man developed a sacrum pressure ulcer which very quickly expanded to a category 4. It became heavily infected, and over the following 15 months in hospital followed by 19 months in community care, the wound has needed daily treatment by usually specialty nurses mostly from tissue viability. Essentially, all available approaches to wound care have been tried including NPWT with and without instillation of saline, but it has proven impossible to close the wound. Judging from the history; the state of the wound; and the fact that chronicity in wounds is due to infection (Leaper et al. 2015) it is most likely that the patient by now has developed a very deep-seated infection that – given all the methods tried – has developed resistance to practically all available approaches. Inadine, Kaltostat, Durafiber,Durafiber Ag,Allevyn Life, Allevyn Adhesive, Allevyn Gentle, Tegaderm foam, Sorbaderm, Debrisoft, Aquacel Foam, Promogran, Iodoflex. Prontosan, Aquacel Ag, VAC pump, Inadine, Kaltostat, Durafiber, Durafiber Ag, Allevyn Gentle Border, Tegaderm Foam, Sorbaderm, Debrisoft, Aquacel Foam, Promogran, Iodoflex, PICO, Suprasorb, Medihoney gel, Packing ribbon, Manuka honey, Flamazine, Cutimed Sorbact, Flaminal Forte, Biatain Silicone, Kliniderm, Allevyn. The wound was being scheduled for surgery. The aim of the Acapsil treatment was to contain the spreading infection and reduce it as far as possible. This would allow for a reduction of the area to be excised as well as significantly increase the chances of success of surgery. Acapsil could then be used again immediately following surgery, in order to remove any remnants of infection and to keep the healing process progressing uneventfully. This goal has been reached Day 21. While awaiting surgery, the further progress will be monitored. While awaiting surgery, the wound is flushed with tap water daily and dabbed dry with a gauze. It is left to air only covered with a simple gauze and no antimicrobials are being used. So far, it has only needed a light, superficial dusting with Acapsil once, due to possible detection of odour. The monitoring will continue until surgery. 3.5-year-old category 4 sacrum pressure ulcer. 17x17 cm covered with bright red shiny skin and scar tissue with a relatively small opening in the centre. As most of the wound area is closed over by skin on top, the wound can only be evaluated from the colour, texture and temperature of the skin as well from the level, colour, texture and smell of the exudate. The 4 pictures below are identical, from Day 0, i.e. before start of Acapsil, and indicate the 4 main areas of the wound. Day 0: The opening and the surrounding skin in the inner blue circle is deep purple and the texture is stiff and hard like cardboard in the entire area within the broad blue circle - the signs of cellulitis in old non-healing wounds. The inside of the wound is brown-yellow and necrotic. The cranial and right sides are undermined by 1 cm (blue line). The wound edges are curved downwards facing into the open cavity. The exudate level is very high. The wound is malodourous. Day 21: Area1: All purple areas have changed to pink and the cardboard-like texture is gone – i.e. the cellulitis is cleared, fending off the acute risk of septicaemia. The skin is now skin-like and even the old scar tissue is well pliable. The inside of the wound is pink and granulating. It has granulated up from the bottom, the opening has reduced by one third from the distal end and the undermining along the right side has disappeared. The exudate level is reduced to being controlled by a cotton gauze. No smell is associated with the wound. Day 0: The distal area of the wound show clear signs of widespread tissue infiltration. Day 21: The area is now cleared of infiltration and the skin is normal in both texture and colour practically up to the wound opening. Day 0: 2 sinuses of 4 and 5 cm, respectively, open underneath the undermining and run cranially under the skin as indicated by the blue lines. 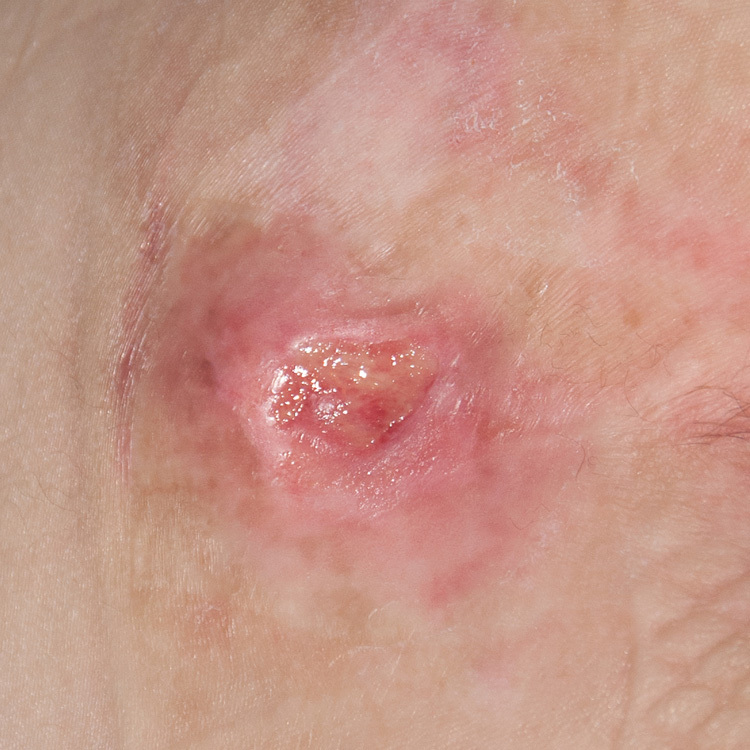 The entire area circled in blue is warm to touch, red, inflamed and swollen with cracked and fissured skin resembling miniature wounds - the signs of infectious infiltration. Day 21: The acute skin infection is cleared and the skin is returning to its normal colour. The 2 sinuses run underneath the deeply infiltrated area making sure the body has a means to drain out the necrotic tissue and the debris created by the infection. The area has clearly reduced in redness and the swelling on left side is starting to reduce. The sinus tunnels have been deblocked and cleared of infection; this is witnessed by fresh tissue being brought out during probing. The sinuses need to remain open temporarily to allow for the regular drainage of infective debris until the entire area has been cleared from tissue infiltration. As practically the entire wound area is covered by skin, only the sinuses represent an opening for Acapsil to reach the distant tissue to support the immune system. The infection is 3.5 years old and judging from the colour of the exudate pushed out on different days, pockets of infection with different infective agents have broken of different days. The process of infection containment and removal is ongoing and, as the wound is 3.5 years old, this will take the immune system some time to penetrate all the pockets and get to the bottom of the infection in all directions. Day 0: Two areas of dense, deep infectious tissue infiltration with no open sinuses running underneath, are outlined in blue. Day 21: The deep-seated infectious tissue infiltration has contracted showing rather clear demarcation borders on both sides in the areas indicated in blue. There are no sinuses or other means for the body to rid itself of the waste products deriving from the ongoing infection removal process. On the right side, the infection is now contained and concentrated in two spots and the body has chosen to open the skin to the surface to rid itself of the waste products by this route. This will create a small wound which will be very easily controlled and closed with Acapsil. This strategy is therefore desirable, as it will lead to resolution of the tissue infiltration in the area. On the left side, the infiltrated area is also in the process of being contained and creating visible demarcation borders. It is still too early to predict whether the body will be able to get rid of enough debris through the obvious cracks in the skin or whether it will have to break through in a manner similar to the right side. A man in his 60es with a history of venous leg ulcers, cancer, colitis and eczema had walked into a camper hook at the back of a car hurting his shin. Originally the ulcer was only quite small and had seemed uncomplicated, however after 4 months it became infected and started to deteriorate. The patient was therefore referred to the out-patient tissue viability team. The same tvn team had successfully healed a VLU on his other leg a couple of years prior. 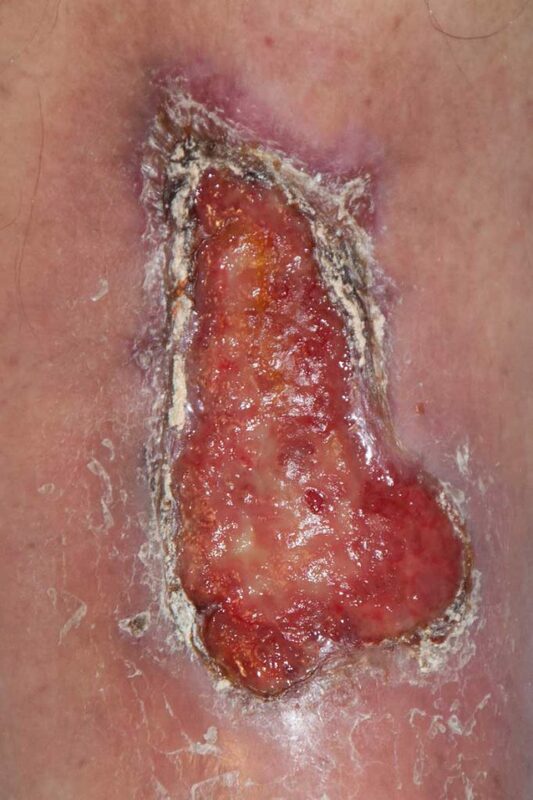 No treatment approaches would improve this venous leg ulcer. Among others, Manuka honey, PHMB, Iodine, Hydrogel and other types of impregnated dressings were used, always combined with full compression therapy. 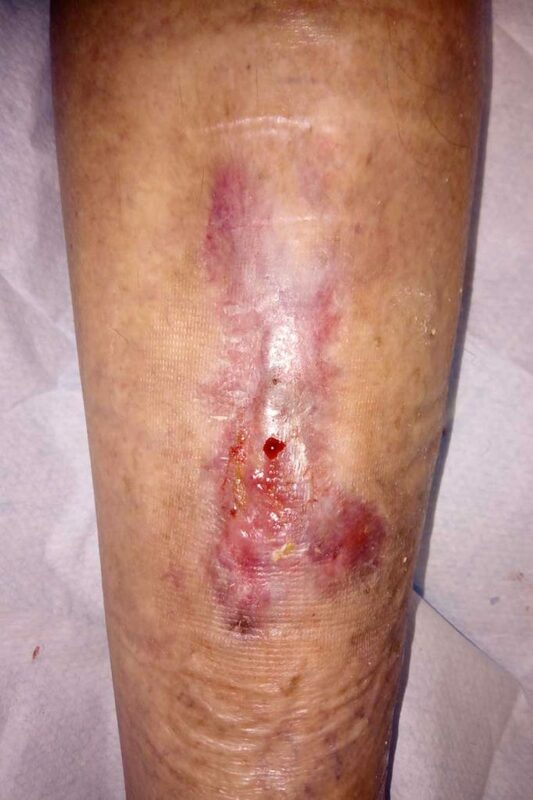 The leg had a very deep-seated Pseudomonas infection and the patient had 3 full courses of systemic antibiotics on that account during the 5 month period. Every time the ulcer seemed to improve and the pain reduced, only to return full scale upon termination of each of the antibiotic courses. The ulcer remained non-responsive and non-healing and when the tissue viability team decided to try Acapsil, it was 94 x 52 mm in size. Over a period of 3 weeks, Acapsil was applied once daily – by the tvn-team during visits and otherwise by the patient at home. There was no need for compression therapy. After Acapsil treatment the tvn team used plain non-medicated , non-impregnated dressings and compression stocking until full closure 2 months later. 35 years ago my wife was one of the first people to live through cervical cancer after having been given a few months to live. She was at Christies Hospital in Manchester and given a new treatment which included a very heavy dose of radiotherapy. Seven months ago, this long forgotten radio-therapy resurfaced by creating various abscesses in her pelvis and thigh. 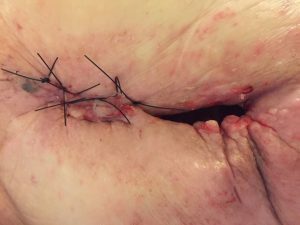 When the surgeons opened up what seemed to be a large pressure sore, they were amazed to find a deep wound created by escaping radiotherapy infection from her pelvis and thigh. What they found was a rectangular wound that was 12 cms wide, 5 cms deep and 12 cms into her flesh at it’s deepest point which fed into a 20 cm sinus that ran into the bone. They decided it was too dangerous to continue clearing it and referred us back to the deep tissue viability team. The wound was taken off Acapsil treatment and the plan was to return to the original team in Oxford with a non-infected, granulating wound on top of osteomyelitic bone. Unfortunately, external circumstances prevented this re-evaluation of the wound and the patient’s clinical possibilities. After a short period off Acapsil, the wound started to break down due to the use of an antiseptic. See below. She was, consequently, put back on Acapsil treatment again in November 2017. During the following months, the wound continued to reduce in size whilst the Acapsil kept the adjacent infection at bay. The patient now engaged with a consultant surgeon at the Royal National Orthopaedic Hospital who evaluated the wound itself and the soft tissue in the entire area, i.e. down along the femur, the entire right buttock region and the area along the spine. He judged the degree of infection, (tissue infiltration) to be sufficiently small and controlled, to make possible the surgical removal of the infected entire hip-bone, followed by closure of the wound. This procedure was performed in stages during October-November 2018. See picture below from 15th Oct.
MPPT is indicated also post-surgery, to ensure the graft takes and to prevent infection in the deeper areas. Due to the extent of the surgical procedure, it was necessary to permit for a short period of rest before, the final plastic follow up with flap operation. This was performed in December 2018 and the patient arrived home in time for Christmas.